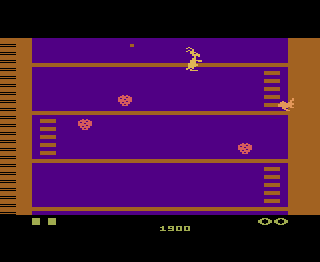 A2600 Kangaroo (USA) in 00:34.8 by nitrogenesis. Baby Roo has been kidnapped by monkeys, and it's up to Mama Roo to come to the rescue! Starting out at the bottom of the screen, she must hop and climb up the various ladders and platforms to the top where Baby Roo is being held captive. The monkeys will try to stop her by throwing or dropping apples and knocking her off the platforms, but Mama can fight back. With her boxing gloves on, she can knock them out with a single punch! Author nitrogenesis improves the previous movie by 38.21 seconds through a new glitch that makes Mama Roo fall through the ground and reappear at the top of the screen. For more information, check out the author's comments.